Requires the player to reach Tier 43 in Season 6 Battle Pass. 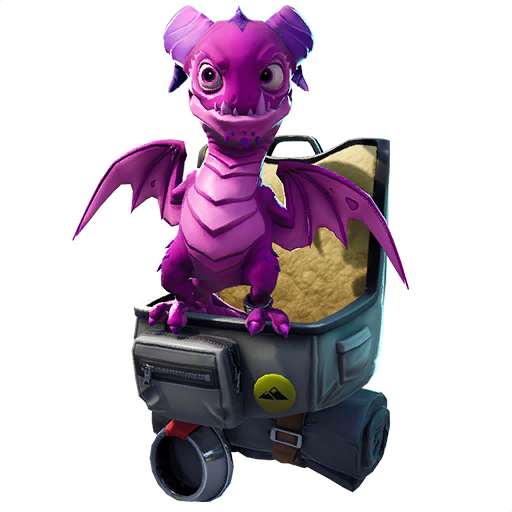 Scales is the name of one of the epic pet cosmetic items for the game Fortnite Battle Royale. Similar to back blings, the pet cosmetic items allow players to carry a little animal in the back of their avatars. Pets do not provide any benefit or added functions to the game. Scales is among the very first pet items released for the game. Scales is among the pet items with unlockable styles. Scales is a little blue baby dragon with a small horn and small wings. Scales ride on top of a gray pet carrier that is strapped on the player’s back similar to a backpack. The carrier also features a gray food bowl and a rolled mat. Scales feature unlockable styles Black and Pink that changes the color of the dragon, but not the carrier. This pet cosmetic item can only be unlocked by purchasing the Season 6 Paid Battle Pass and reaching the tier level of 43. Scales high-quality PNG images with transparent background to use them as you wish (YouTube thumbnails, skin concept and so on). Hey, I’m glad you are still doing these! Thank You!